Deborah Glass, the Deputy Chair of the IPCC has said that Simon Harwood has been held accountable for his actions and that Ian Tomlinson's death could have been avoided. Former Pc Simon Harwood will be able to claim his police pension when he reaches the eligible age, despite being sacked for gross misconduct. She said: "Simon Harwood will retain his pension when he reaches pensionable age. I'm unable to remove his pension because he has not been convicted of a criminal offence." Tomlinson family: "It's like we are back to day one"
Ian Tomlinson's stepson Paul King has expressed his anger at the outcome of the hearing, calling it nothing more than "showboating." He said: "I think it's pointless, it hasn't proved anything to us. We still haven't got any answer from this. After three-and-a-half years, I think its diabolical. It's like we're back at day one. We will carry on, it isn't going to be the last of it." Speaking after the hearing, Deputy Assistant Commissioner Maxine de Brunner apologised to the Tomlinson family but insisted that the maximum penalty possible was delivered today. Today's hearing has resulted in the maximum penalty that was ever available to the panel - dismissal due to gross misconduct. This leaves no ambiguity as to how the Met views the actions of Simon Harwood. Simon Harwood does not reflect the professionalism of the majority of officers working in public order, often in the most difficult of circumstances. I hope that this one officer's actions in 2009 does not taint the public opinion of officers who have worked tirelessly this year supporting events such as the Jubilee and of course the Olympics. The family of Ian Tomlinson has dismissed a Met Police hearing against PC Simon Harwood as "a whitewash". He now faces the sack. PC Simon Harwood, who was cleared of killing Ian Tomlinson, will be sacked after being found guilty of gross misconduct by a disciplinary panel. "We came here expecting a disciplinary hearing. There hasn't been a hearing. "We expected the Met to rule on whether its officer killed Ian. "The Met basically are going on a 'no comment'. It's a whitewash, it's like they've let him resign already." The conflicting evidence from the inquest and the criminal courts are still to be resolved. We won't give up yet. 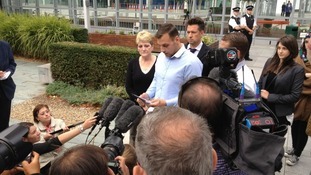 We'll now take this to a civil court where we will try to find final judgements on who killed Ian."